Product prices and availability are accurate as of 2019-04-25 00:55:34 UTC and are subject to change. Any price and availability information displayed on http://www.amazon.co.uk/ at the time of purchase will apply to the purchase of this product. 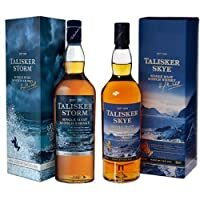 The Single Malt Whiskey Store are proud to stock the excellent Talisker - Single Malt Scotch (2013 Edition) - 25 year old Whisky. With so many available these days, it is wise to have a brand you can trust. The Talisker - Single Malt Scotch (2013 Edition) - 25 year old Whisky is certainly that and will be a great buy. 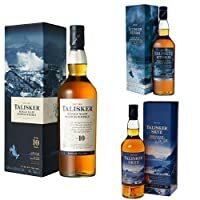 For this reduced price, the Talisker - Single Malt Scotch (2013 Edition) - 25 year old Whisky is highly recommended and is a popular choice with most people. Talisker have included some excellent touches and this means good value. 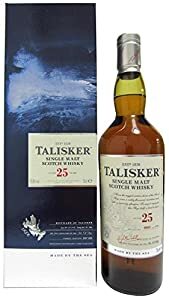 Talisker was once described as "the king o' drinks" by one of Scotland's most famous sons, Robert Louis Stevenson and if the 10 year old is one of the official classic malts in the Diageo range then the 25 is the Ace in the pack. This is the 2013 release of just 5772 bottles and 100% matured in Ex-American oak. Nose: Caramelised pineapple on a coastal bbq with sweet chilli, pink wafers, pink peppercorns, smoked ham with honey and raspberry marinade and a strong whiff of coastal smoke and volcanic rock. Palate: Salted toffee, smoked red apple, earthy honey, tarry bonfire smoke, pink peppercorns and spicy sausage. Finish: A sweet and savoury bbq (imagine pineapple and chilli flake sausages griddled together on a coastal bonfire) red liquorice, salt and pepper short ribs along with some crunchy red berries and lasting spice. Elegant yet powerful, well balanced and moreish. Simply stunning 25 year old malt from one of the most reliable distilleries in the world.